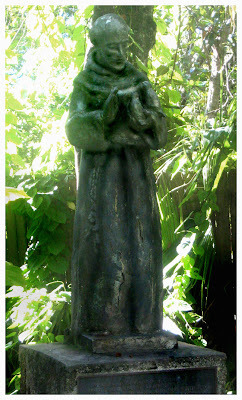 Standing at the back door to my boyfriend's house, I read the Prayer of St. Francis many times. I never got tired of it because it was so beauitful and because it belonged to the kindest and most saint-like woman I have ever met. So many, many years ago. 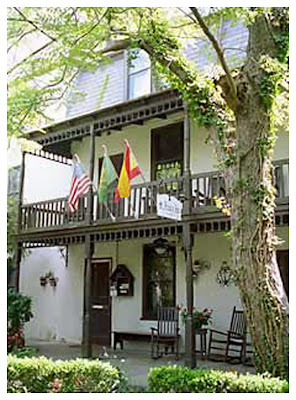 When the St. Francis Inn popped up as a Bed & Breakfast in St. Augustine during my searching, I checked it out because of the name. It had great reviews online, so off we went. 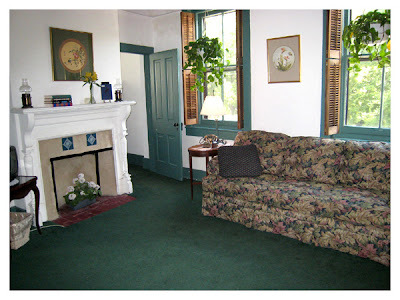 But I was still a bit skeptical of staying in "someone's house" as B&B's sometimes seem to be. But we loved this place! It was an inn, not where the owners lived. Courtyard looking towards the entrance, the "back of the building." The courtyard just to the left of the picture above looked like this. I read after we got back where someone wrote that it was "old" inside. Wow, who would have thought a place built in 1791 would be old???? It was very nice, but certainly not renovated to new looking. It still had lots of character. Our room was actually a suite, and we loved having the sitting room in addition to the bedroom and bath area. It really made it seem like home away from home. We never moved our car from the private parking area. The downtown area was very close and we walked a lot, used the trolley for the 3 days to get to anything too far to walk. The inn also had complimentary bikes which was a lot of fun to go looking at houses. The breakfasts were full meals, and cooked by their chef. Excellent! You B&B Gals might have won me over now. Not having to go find a good breakfast really was a nice treat. There was a tiny little park across the street with a most charming statue. My friend, St. Francis, was standing towards the back keeping a watchful eye on the street and the inn as well as the animals I'm sure. Thanks for your notes on the previous posts. I know so many of you love vintage and antiques, and of course old houses. They just call out to you don't they? That looks like a great place. I'm with you on the B&B's. I like my privacy, but this one sounds perfect. Glad it was such fun. I like walking everywhere too! Funny the things that strike a memory. When I was little we took a cross country car trip to Florida. We visited a house in St. Augustine (supposedly the oldest one in America) There was a garden you could walk through and my only recollection was looking down to see the biggest, fattest, most colorful slug like bug I'd ever seen. I let out a blood curdling scream and my Dad had to remove me immediately. I couldn't tell you anything about the house or if it was indeed the oldest....I just remember the shear terror of facing that bug. LOL! That B&B looks beautiful. I've never stayed in a B&B. Just received my package of french collage goodies from you today. I just love them and wanted to let you know. I am excited to use them to make a Paris Journal to remind me of the trip I made to Paris last year. 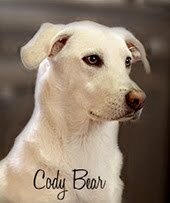 I'll post a picture of it on my blog when I am done. Thanks so much for the lovelies! Oh Donna, we've been by that one before and wondered what it would be like to stay there! I'm so glad you did and that you enjoyed it! Staying at a B&B is on our list of things to do.. I love St. Augustine! What a beautiful B&B. We've stayed in a few. I think our favorite was White Gull Inn in Fish Creek(Door County WI). We had a private glass and screen back porch that overlooked the courtyard. Wonderful! 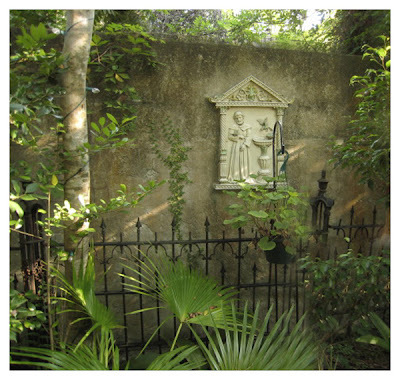 As you know, St Francis is keeping watch over our creekside garden and all our little creatures, inside and out! Hi, Donna! So glad you had a great time on your trip. I've been busy this week & haven't had a chance to stop by til now. Aren't you hooked on B&B's now? I thought you would enjoy them. They are so personable & the food is usually wonderful. All your pics are great! Glad you had fun. Oh, those old historical homes in Savannah get me every time. They are SO gorgeous when they're all redone, but you're right about how hard it is to get that done. I wouldn't have it in me either. What a neat coincidence, and a beautiful bed and breakfast. Your trip sounds like so much fun. It's good to get away sometimes, isn't it? Plus like you said, one can so often just walk to dinner and the like. So nice. Oh Donna! Isn't staying at a B & B wonderful? I had to beg Bill to go to the first one years ago but now, he is a B & B man! We have loved every one we have visited...each so unique and special. I am tickled you had such a sweet time. Your pictures have been lovely. I adore Savannah and so wish to return. Your pictures make that longing a bit quieter for now!